What matters more: Experience or education? DSIM Provides Both! 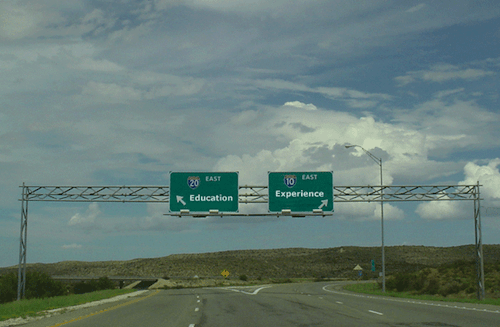 Home > Blog > Blog > What matters more: Experience or education? DSIM Provides Both! Do you know Bill Gates, Michael Dell, and Steve Jobs? How can one be unaware of some of the most successful entrepreneurs of the world? Right? But do you know they are college dropouts as well? Such examples sometimes make it tough to decide whether a college degree is more essential or the experience. This is what! How can we find out as to what is more important while you are hunting for a job? This is why right now we are going to talk about what matters more –experience or education. A lot of people do say education provides something that experience can never however others say that experience makes up for the lack of a degree. When we asked the same to our Facebook fans, they came up with varied response. A recent study revealed that 25 % of employers value a bachelor’s degree more than they did five years ago. 39% value a degree about the same. But then, almost half of those employers had trouble finding qualified graduates to fill positions at their organization. According to them those holding a bachelor degree usually lack basic workplace skills such as communication and problem-solving. There are so many people who think that it’s not the degree that’s important; it’s what you learn and how you apply it. Besides, you will hardly find anyone who would dispute that a college degree opens doors. However, large number of people think that the two go hand in hand. For them, education is the foundation while experience is the construction of becoming greater. If you really mull over it a little deeply, you will certainly find that whether its education or experience, whatever is that, the employer and the line of work is something that can decide better about what matters. For instance, if it’s surgery, experience counts. However a medical degree would still be required. So, sometimes its education, sometimes its experience, but for all time it’s both! How DSIM Provides You both? To make sure that you enjoy your learning, the training is a perfect blend of theory, practical, assignments and case studies. The training starts with Digital Marketing overview. Then, to provide hands-on-exposure, you create a website with step-by step guidance from our trainers. The purpose behind creating a website is to make sure that you are not only learning Digital Marketing, you are actually doing it. Once you have the basics in order and your website up and running, the training kick starts to more advanced modules, wherein you learn Search Engine Optimization, PPC Advertising, Google Analytics, E-Mail Marketing, Mobile Web Marketing and online advertising. Another interesting component in this training is Social Media Marketing which comprises of Facebook, Twitter, LinkedIn, Google +, Pinterest, Viral and Video Marketing. Also, keeping modern day business requirements in mind, this training has a very important component, i.e., Lead Generation for business. Under this component, you not only learn how to create effective landing pages, generate business leads but, also how to convert leads into sales. Once you are well versed in these components, you master the 1st objective of the Training Program. Moving onto the second objective, which is making money online, our team of renowned Affiliate marketers will train and share tips and tricks on how you can make money online with Affiliate Marketing and AdSense Blogging. So, this means you can mint money online anytime, as a part-time or full-time freelancer. All you need is a laptop and an internet connection! After successful completion of the Training Program, you not only become capable to track and monitor Digital Marketing performance but, you will be able to plan, conceptualize and implement Digital Marketing strategy yourself. Put simply, you become an expert in marketing any business online. In case you miss a class or do not understand any topic, you can easily re-attend classes in parallel batches at no extra cost. Even after the completion of the training program, you are not left stranded; DSIM’s ex-trainees get a privilege to attend a 2 hour free doubt session organized every month! Not only this, DSIM’s trainers are industry leaders and experts having years of experience in the Digital Marketing domain.